The Niagara Falls PowerHawks skated away with a 7-2 victory over the visiting Skylands Kings, cementing their hold on second place in the Northeast Division. Through a trio of games over the weekend, the PowerHawks earned five out of a possible six points. The Skylands Kings once again jumped out to an early lead with Sergei O’Sullivan getting the puck past Kris Augustine at 6:29. Eric Vanderhoff and Craig Garrigan assisted on the goal. On the ensuing stoppage of play, Skylands goaltender, Mathias Yttereng, kicked Andrew Logar, resulting in a 5-minute penalty and an ejection from the game. Josh Sears came in as replacement for the Kings. On the major penalty, the PowerHawks were able to score three goals. Matthew Minichiello tied the game at 7:04 with assists from Logar and Anthony Tomassi. Evan Domiano went end to end after getting a pass from Branden Tripi, putting the puck into the net behind Sears only 87 seconds after Minichiello’s goal. Brandon Snyder completed the triple scoring with the extra man at 9:06. Frankie Bodami and Domiano supplied the assists. Branden Tripi scored the lone goal in the second period on the power play. The goal, coming at 4:51, was assisted by Logar and Stephen Minichiello, and gave Niagara Falls a 4-1 lead heading into the third. Domiano scored his second of the night only 1:05 into the third period. Logar and Michael Olszewski assisted. Steven Ford gave the Kings a little glimmer of hope when he scored at 9:37. Dylan Dinzik had the lone assist. Frankie Bodami put the momentum back into Niagara Falls’ hands with a goal at 11:08. Spencer Hrynczak and Brandon Snyder were credited with the assists. Bodami scored again to close out the scoring for the day at 14:30. Olszewski and Logar provided the assists. Kris Augustine stopped 24 of 26 shots faced in picking up the win for the PowerHawks. Yttereng stopped all six shots against him before he left early in the first period. Josh Sears turned away 26 of 33 shots for the Kings. 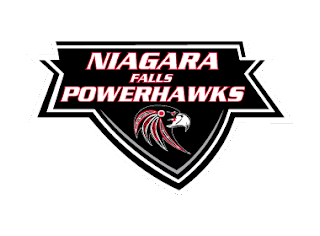 The Niagara Falls PowerHawks will host three games at the Hyde Park Ice Pavilion this upcoming weekend. Friday night, the Roc City Royals will visit for a game at 7pm. The PowerHawks will then host the Oswego Stampede Saturday and Sunday. Game times are set for 6pm and 1pm, respectively.